A Taste of History with Joyce White: What Do Calves Feet, Fish Air Bladders, a Hot Air Balloon, and a Racehorse All Have in Common? What Do Calves Feet, Fish Air Bladders, a Hot Air Balloon, and a Racehorse All Have in Common? Gelatin, in one form or another, has been used for culinary purposes for centuries. One of the earliest forms of making gelatins was to extract the protein-rich collagen from calves feet. The process for doing this took at least six hours and was a stinky, messy affair. By the way, sick people were often given calves feet jelly as a curative--our 21st century selves would probably think that was adding insult to injury. However, it was probably a good way to get nutrients into a person whose illness may have prevented them from proper nutrition. Another method of gelling foods was to use isinglass. 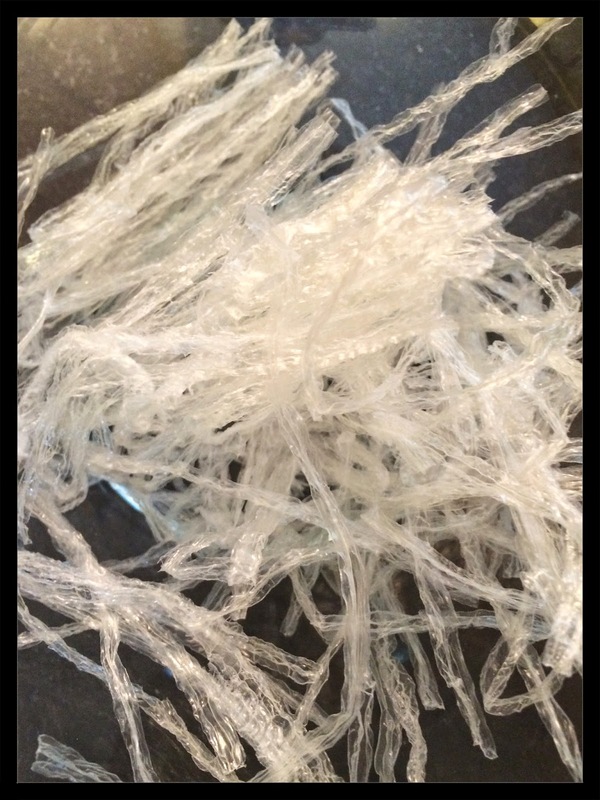 Isinglass is an almost pure form of gelatin that is obtained from the sounds or air bladders of some fresh-water fish, particularly Russian sturgeon. It can also come from catfish, hake, and cod. It has been used in cookery for making jellies and clarifying liquors. It would be just as good as modern forms of gelatin but the high cost of isinglass has probably made it obsolete for most modern cooks. The first English patent for the manufacture of gelatin was granted in 1754, but there is no proof of this and no evidence anything was ever done with it. The first type of "instant" unflavored dried gelatin hit the market in 1842. 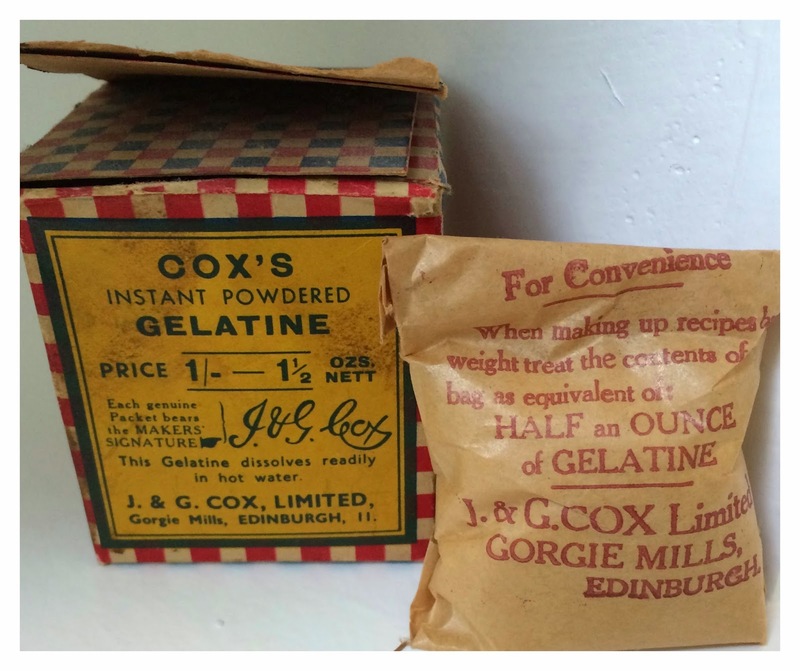 It was offered by the J and G Company of Edinburgh, Scotland and was known as Cox's Gelatin. Cox's Gelatin was exported to the US in that same year. American instant dried gelatin was first introduced by Peter Cooper (inventor of the steam locomotive and apparent fan of gelatin) in 1845. He marketed this product as "Portable Gelatin." As an aside, there are many recipes for demi-glace veal stocks in the 18th-19th centuries that are cooked down to a gelatine and called "Portable Soups." There were other gelatin manufacturing attempts such as Nelson's Desiccated Gelatin (which seems was first introduced for use in photography ) and Phosphated Gelatin made by the Plymouth Rock Gelatin Company of Boston in 1889. None of these products did well commercially. It wasn't until 1894 that instant gelatin truly became a staple pantry item in home kitchens. Charles Knox introduced his form of granulated gelatin which became much more popular than any of the other attempts that came before to get gelatin in every home kitchen. Was his product so much better than the ones that came before? Probably not. What was different was that Knox was great at marketing his gelatin. He marketed it by innovative advertising for the time, he named a motorized air balloon the "Gelatin" and flew it in air shows around the country, and he also bought a prize-winning racehorse and named it "Gelatin King." Furthermore, when Knox died in 1908 his widow took the reigns of the company and further promoted the gelatin by establishing a test kitchen that created numerous gelatin-based recipes which were printed in cookbooks, newspapers, and leaflets that were widely distributed. Jell-O emerged in 1895 in LeRoy, New York when Pearl B. Wait (a cough syrup maker) and his wife, May, experimented with adding fruit syrups (strawberry, raspberry, orange, and lemon) and lots of sugar to gelatin. They called it "Jell-O" and history was made. Unfortunately, the Waits never really benefitted financially from Jell-O because they had problems marketing it (perhaps if they had followed the lead of the Knox company and purchased a prize-winning motorized horseless carriage they named Jell-O Speed Demon they would have been more successful). Instead, in 1899 they sold it to their neighbor for $450. It took a few years of, you guessed it, creative advertising and marketing, but under the new ownership Jell-O certainly did take off and the brand name is now synonymous with gelatin. And, by the way, today's commercial gelatins are still made with animal collagen from cows and pigs so it is not a vegetarian food! However, vegetarians can find seaweed (carrageen) based gelatins on the market. Interestingly, in 1927, Jell-O marketed a Chocolate Gelatin but it must not have done very well because it was discontinued in the very same year. The Jell-O company had good reason for attempting to market a chocolate flavored gelatin product because lots of recipes for them did exist in the 19th century. Having scraped very fine six ounces of chocolate, dissolve it in half a pint of boiling water. Break up and dissolve one ounce of Russian gum isinglass in just enough boiling water to make it a thick jelly; then strain it, and mix it with the dissolved chocolate; add six ounces of powdered white sugar, put it in a skillet or kettle, give it one boil up, and put it in a mould to congeal. 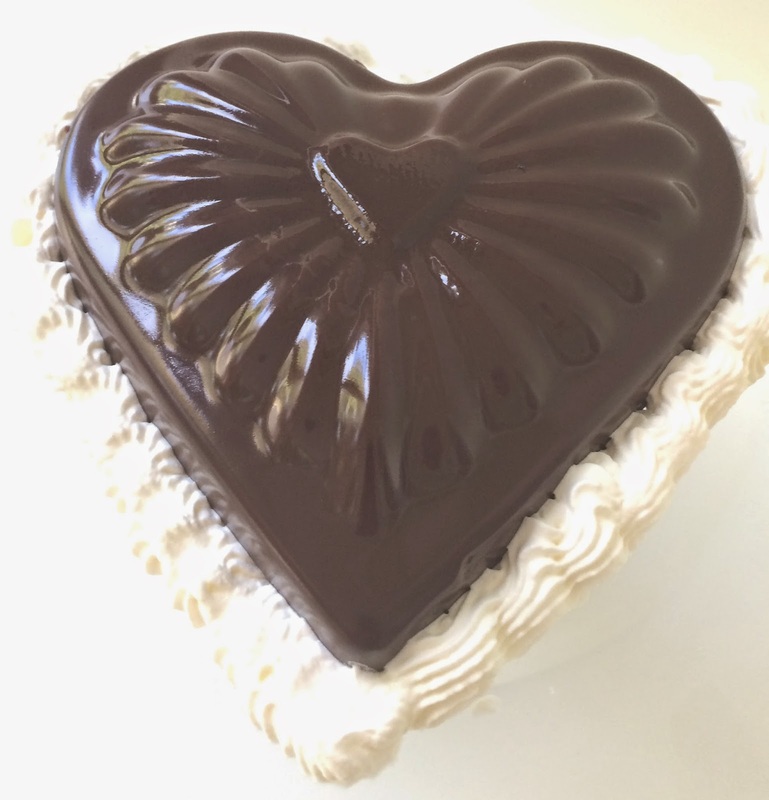 Have a gelatin mould that can hold about 4 cups ready for use; decorative ones make the jelly look special. In a medium saucepan, pour 1 cup boiling water over the chocolate. Whisk together and set aside. In a separate small bowl, empty the packets of gelatin into a medium bowl. Cover the gelatin with the remaining half cup of boiling water. Whisk together and let sit for about five minutes. Sieve the gelatin mixture into the saucepan with the chocolate/water mixture. 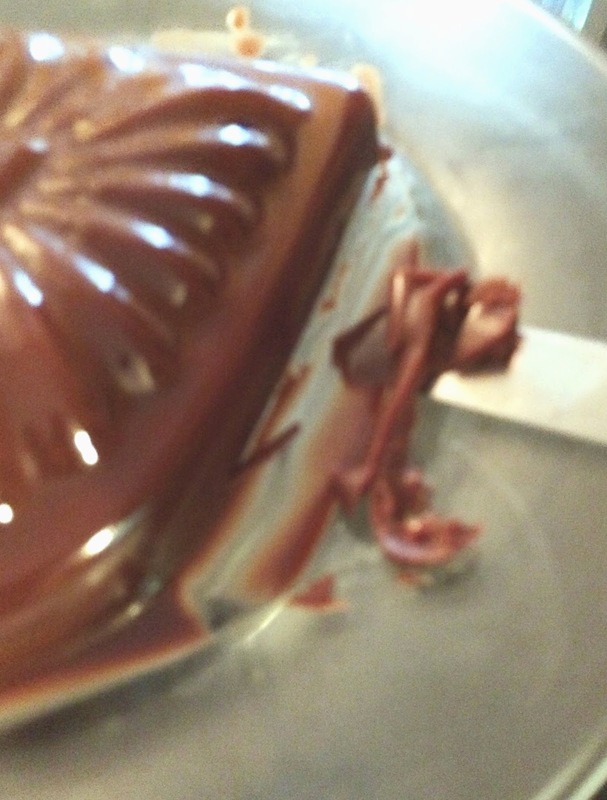 Whisk the gelatin into the chocolate and then add the sugar. Whisk until everything is well-blended and no sugar is visible. Place the saucepan on the stovetop and bring to a boil over medium-high heat. While boiling whisk the chocolate about five times and then remove from the heat. 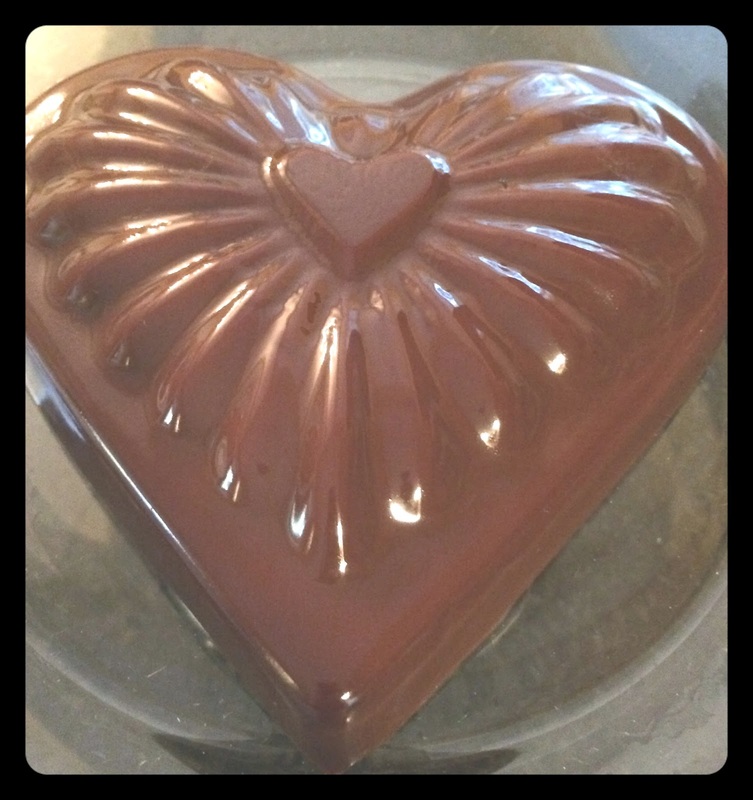 Pour the chocolate gelatin mixture into your mould. Set aside until it cools. Then put it in the refrigerator for at least three hours, or until it sets firmly. 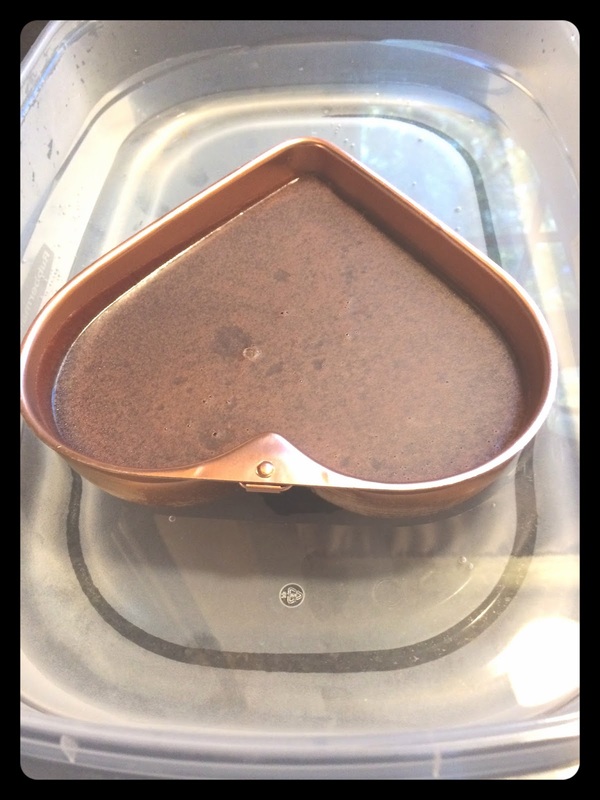 To remove the chocolate gelatin from the mould, place boiling water in a bowl that is large enough to fit the bottom of the mould. Insert just the bottom and sides of the mould into the water hot water bath, being careful not to allow any of the water to collect on top of the gelatin (see picture below). Keep the gelatin inserted for about 30 seconds or until you see it starting to pull away from the sides of the pan. Invert on a plate--it should fall into the plate. If it doesn't fall out, repeat the process until it does. In removing the jelly, you may see that the sides of it may melt a bit. That's normal. Just stick it back in the fridge and let the melted bits congeal. Then, remove it from the fridge and use a knife to cut around the perimeter of the mould. Then lift the jelly off that plate; it will be perfect (see pictures below)! Just place it on a serving dish and decorate with whipped cream, fruit, or anything you desire! Very interesting...... In the book Pollyanna, she takes calves foot jelly to someone who is ill.... exactly as you described. I love anything in a mold, so this might be something I might try. Yes, it was a very popular curative. Try it and let me know if you like it. My husband was not a big fan but he's very picky. It has a very rich chocolate flavor. I think when looking at it you think it will be creamy which it is not--could be why he didn't like it. Just put it in the fridge. Hopefully I will unmold it nicely and will let you know! That's Great. Send a picture if you can. Either here or on my Facebook page. I didn't know that one could actually procure isinglass in this day and age... now I guess I'll have to give it a try!